If you’re a viewer of the HBO hit, “Silicon Valley” then you probably recognize this quote. It is from the main character and CEO of “Pied Piper,” Richard Hendrix. So what is he going on about? Is it completely fiction or is it based in fact? The truth is that Richard isn’t crazy, and his new internet may soon be coming to a home near you in the form of Mesh Networking. So what is Mesh Networking and how does it differ from traditional networks…and how will it change marketing? 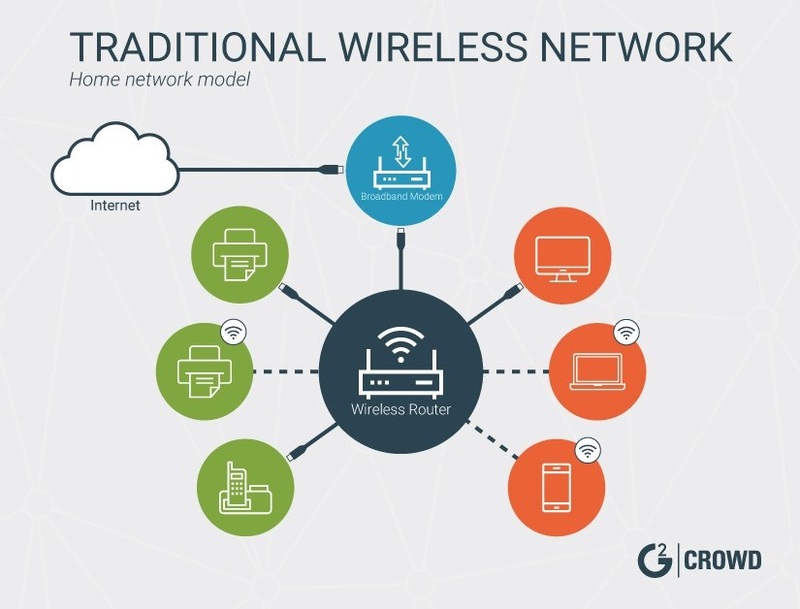 Traditional wireless networks transmit a signal from a central router, creating a radius in which devices can connect directly to the source and receive the signal. In the traditional network, devices which are farther away may experience attenuation in signal strength, and eventually at a certain distance the range of the signal is too weak for a device to connect. Alternatively, think of a mesh network like a woven fabric in which each device is interconnected. 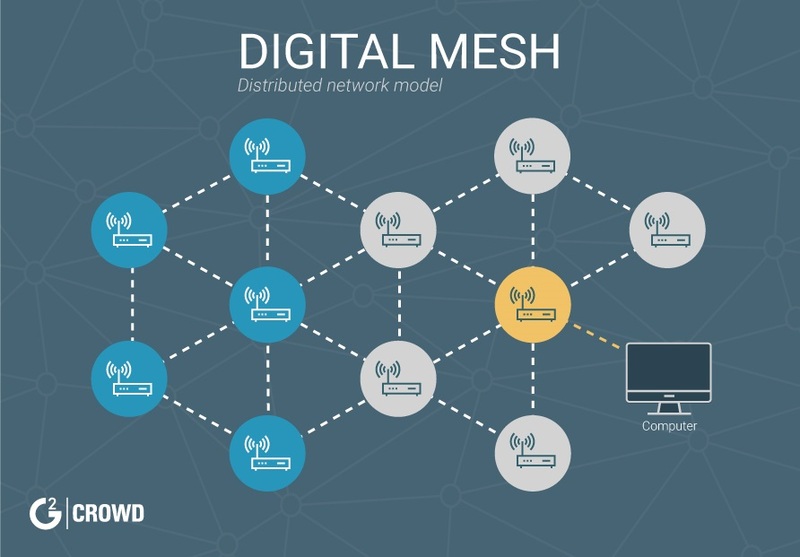 Rather than the wireless signal being distributed in a wide range, each device connected to the mesh network acts as a node, connecting to the signal and passing it on to the next device. Nodes create network links with other nodes around them, letting signals pass from node to node in a number of paths throughout the mesh. Each device thinks that it is connected to the central router. Signal strength is not lost as it makes small jumps from device to device. Because of their decentralized nature, mesh networks can continue to scale almost endlessly, maintaining signal strength and the ability to send and receive data. Mesh networks are resilient, self-configuring, and efficient. You don’t need to mess with them after what is often minimal set up, and they provide arguably the best and highest coverage that you can achieve in your home. Outside the home, mesh networks enable IoT devices to function in remote areas where a traditional network may not be able to reach, and help ensure devices are continually connected to networks without downtime. According to a Research and Markets report, the wireless mesh network market is expected to grow to $8.9 billion by 2023, growing at a rate of 9.6 percent CAGR during the forecast period (2017 to 2023). Physical Attacks: Internet access speeds up when more users contribute to the network, but it also opens up the network to multiple points of access. As all computers in a wireless mesh function as routers, each computer represents a possible point of attack. Computer nodes also can be compromised by the loss or theft of a laptop or desktop computer. In this case, the attacker stealing the computer can use the access provided by the stolen computer to enter the network, or simply disrupt the entire system by removing crucial routing nodes. Denial of Service: Even without physical access to the network, hackers can create “zombie” computers using virus infections. Once infected, each computer does the bidding of the attacker without direct monitoring. Meanwhile, the hacker launches a concentrated denial-of-service attack, which floods a particular computer or system with overwhelming bits of information to effectively shut down that system’s ability to communicate with other networks. If a computer in a mesh network becomes infected, it can attack other computers inside its own network, and infect them as well, causing a cascading effect. Passive Monitoring: A zombie computer doesn’t need to attack the system to cause damage. Hidden and compromised computers can passively monitor Internet traffic moving through the network, giving the attacker the ability to intercept bank information, login credentials for any website accessed and routing information for the network itself. At this point, the attacker can choose to leave the network without anyone knowing, while possessing enough data to steal bank funds, commit identity fraud or re-enter the network at will. Gray, Black, and Wormholes: If a computer becomes infected or malicious computer enters a mesh network, it can pretend to be a trusted member of that network and then modify sent data and disrupt how the network passes information. In a black hole attack, information passing through the infected computer will not continue through the network, blocking the flow of data. In gray hole attacks, some data may be blocked, while other data is allowed, making it seem like the computer is still a working part of the network. Wormhole attacks are harder to detect: They tunnel into a network computer from the outside and pretend to be other nodes in the network, essentially becoming invisible nodes. They can then monitor network traffic as it passes from one node to the next. So how is this relevant to marketers and how will it change the scope of marketing? To begin, the rise of “smart” devices is continuously increasing the capabilities of social media and digital marketing sectors. By having every device connected into an interlinking system, the possibilities of communication, cookies, and advertisements increases with every new device added. Fridges can send information about buying habits and your phones can detail everything about your travel routines. While scary at first, in a world where the consumer is put first, it opens up the doors for a truly massive addition to marketing campaigns. Additionally, by essentially becoming our own wireless networks, we are then given the opportunity to market our own social pages as well as businesses for traveling entrepreneurs. By setting up “localized push notifications” we could have events and people be “live” broadcasting at all times for special offers. This could allow for flash sales in certain areas and during events as well as provide free promotion for traveling artists. This leads into the final benefit, which is that mesh networking helps to expand internet connection and thus digital marketing outreach into low-populated areas. This not only is great for businesses but consumers in rural areas as well. No more going to Grandma’s and being disconnected from the world. With interconnected devices sharing bandwidth and publicly owned terminals extending into rural areas we will have most of the planet with access to internet. The best part is that it will probably (at least a small part of it) be free. What’s really revolutionary about mesh networking is the fact that it provides a means for people to self-organize into communities and share resources among themselves: Mesh networks are operated by the community, for the community. 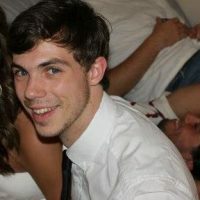 Self-organization means less groundwork for you as a marketer!